The final two figures in TFC Toys' "Hercules" series are scheduled to ship out this week. In anticipation of their arrival I'm looking to review the third and fourth releases, Structor and Dr. Crank, starting with the former. He is an homage to the G1 Constructicon leader, Scrapper, and similarly takes the form of a front loader (apparently, also known by several, similar names) and forms the gestalt's right leg when all six members merge. With the arrival of Structor we were halfway in for the six-member team. Let's see what Structor brought to the table and whether or not we jumped the gun on preordering the fourth member almost simultaneously with his purchase. I'm going to start by covering Structor's alternate mode, which is lots of fun thanks to being a contruction vehicle. Like the previous release, Heavy Labor, Structor recalls the joy of pushing around your Tonka dump truck and "building" something in your living room with an imaginary team of engineers. TFC's design offers a robust payloader with plenty of sculpted detail and a bucket with a working piston, just like we saw with TFC's first Hercules release, Exgraver. Structor's size implies a monstrous construction vehicle the likes of which I'm not sure even exists in the real world. Using the sculpted ladders on each side as a reference you would imagine he's built like a tank! The operator's cabin helps to support that theory with it's sculpted doors. Like Exgraver, Structor's cockpit is a separate piece that pegs into the vehicle on the top. I don't think I addressed this in Exgraver's review, but both cabins have a peg on the bottom AND the top. It may just be a side effect of the production process, but seems too obvious to not have a purpose. TFC has alluded to Hercules having a secret leading some fans to speculate that he may feature his own alt mode. As far as I know, no real evidence has emerged, however the next figure in the series, Dr. Crank, adds a bit of fuel to the fire, but we'll save that for his review. Converting Structor into his robot mode is a fairly straight-forward process, but he does end up with the most "kibble" out of the first half of team Hercules. The back end of the loader is locked down on each side, so you first have to flip out the locks, thus allowing the entire back end (which houses Hercules' right knee joint) to flip up. You then raise the bucket to it's maximum height, unlock the arms (the sections with the sculpted ladders) and fold out the legs which formed the main body of the loader. That allows you to fold up the panel holdind the back end against the backside of the cabin. Each leg has a fold-down panel that forms the back half of the feet, supporting the weight of the robot. The sections holding the front wheels rotate 180 degrees to bring his shoulders to the front. The fists flip out from inside each forearms and finally, you pull out his head which is hidden inside his chest, "whack-a-mole" style. 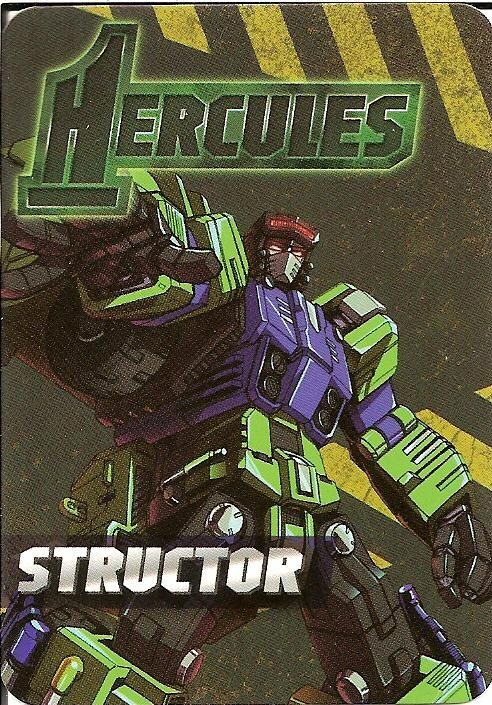 Structor's head features light-piping just like the other Hercules figures. I really like his head sculpt and the combination of the individual eyes (as opposed to one visor) and face shield looks great! Just like the G1 Scrapper toy, Structor's load bucket ends up on his back, behind his head, that along with the loader's back end create a lot of kibble for this robot. However, I do understand why they kept the back portion intact. Since it houses the gestalt's knee, having it break apart during the conversion process, just wasn't an option. Structor sacrifices a waist swivel in exchange for the chest hinge that doubles as Hercules' ankle joint. I can't say I miss that movement much because he has plenty of range: swivel/hinge shoulders, hinge elbows, swivel/hinge hips, thigh swivels and ratchet knees. Unfortunately, his head is reduced to just a swivel and he doesn't have any articulation in the wrists aside from the hinge that swings them out during his conversion. Also, he lacks any movement in the feet. Thankfully, his shortcomings don't completely stop you from achieving some nice, dynamic poses. Structor's final mode sees him form the right leg for the combined Hercules robot. Once you push his head back into the chest, simply flip his forearms up against the upper arms, locking them in place where they tab into each other. Rotate the elbows up so they're pointing forward, or in the direction his chest is facing. Then, you really only have to convert his legs into the back half of the loader again. Once you flip him upside down, you'll find the bucket now forms the front half of his feet while the arms form makeshift heels. Rotating the black piece in the center of the loader's back end reveals a port where the peg on Heavy Labor inserts to combine the two robots. Structor includes two weapons: identically sculpted blasters molded in transparent red and purple plastic, respectively, which can be hand-held or plugged into various ports while in vehicle mode. He also includes to "wings" that can plug into each side recreating the classic toy's powered-up mode and combine with a piece of the final figure, Mad Blender, to form Hercules' chest shield. Similarly, the blasters of each robot will combine to form a giant rifle for the gestalt, I'll have pictures of that with Dr. Crank's review. Structor is another fun toy on his own and another great "classics" version of a G1 character. I received him on Christmas Day as a gift from my girlfriend, so price wasn't an issue for me on this release, but you can expect to pay approximately $100 for this guy after shipping. Whether he's worth that much to you, is a different story. For me it all comes down to the final combined form of all these robots, which is my main motivator for buying into the series. The fact that Structor is a fun figure on his own is just an added bonus.